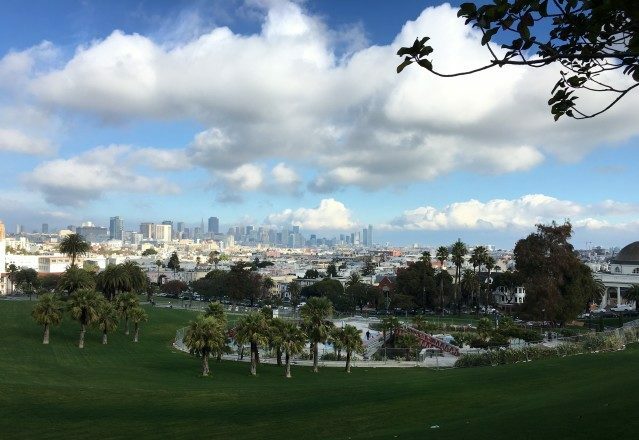 The view from the tallest corner of the park near “gay beach.” Photo: Joe Rivano Barros / Mission Local. A group of homeowners surrounding Dolores Park are unhappy with fellow residents’ plans to form a so-called Green Benefit District — a program that would tax those homeowners to provide additional civic services. The Mission Dolores Green Benefit District (GBD) has been in the works since last spring, and its proponents support the extra taxes because they claim city services are not adequately addressing what they feel are chronic problems around the park: namely, an excess of trash, “public safety” concerns, and neglected green spaces. “We are a group of local residents and business owners who love our neighborhood and are motivated to make a difference,” said Conan McHugh, speaking on behalf of benefit-district backers. But the idea is far from amenable for some — possibly many — homeowners in the area. They are not thrilled by the notion of paying hundreds of additional dollars in property taxes for services they argue would be duplicative. “My question is: What are these people going to do that city agencies aren’t already doing?” said Rick Carrel, who lives on Cumberland Street, near the park. The criticism isn’t uncommon. San Franciscans have tried to establish Green Benefit Districts on four prior occasions, but only one attempt succeeded, in 2015, in the Dogpatch. Wary homeowners scuttled attempts in the Inner Sunset, the Haight, and Golden Gate Heights. That GBD proposal, which would have covered parts of the Haight, died in January. The Mission Dolores GBD still has a long way to go. A forthcoming “weighted” vote — homeowners with more property, who would be taxed more, get more sway — requires 30 percent of respondents vote to tax themselves. That would kick off a second weighted vote that would require a majority in order to pass. It would then require the approval of the Board of Supervisors. If the process succeeds the benefit district would be established by January 2020. A meeting regarding the GBD will take place tonight, April 17, at 6:30 p.m. at Dolores Park church (455 Dolores St.). Residents like Peter Lewis of the Mission Dolores Neighborhood Association — whose board voted to oppose the effort in Mission — questioned how the money would be used, pointing to the $126,100 the Dogpatch GBD executive director, former District 3 supervisor Julie Christiansen, earned in 2017. That GBD in 2017 had revenues of $698,605. Lewis speculated that would-be executive director of the proposed Dolores GBD would make the same, if not more. “But they’re not talking about that,” Lewis said. Others, like Leane Collins, who also owns a home on Cumberland, questioned the level of support the GBD actually has received so far, despite claims by its proponents that interest was “robust.” Out of the 4,338 parcels in the survey area, 612 people responded to the survey, with 36 percent of them supporting it and 46 percent wanting more information. “I wouldn’t have interpreted those as ‘robust’ at all,” Collins said. She also worried about what it meant for people who are unhoused. “There’s this implication in what they write that somehow this is going to remove the homeless people,” she said. “It’s unfortunate that this is looking like an internecine neighborhood war,” he added. Many of the residents Mission Local spoke to also wondered why the city was pushing for the districts, which would provide private services supplementing its own. San Francisco Public Works, indeed, has a staffer dedicated to coordinating their implementation, and the Dolores GBD has received roughly $133,000 in city funds for the GBD’s promotion. The project budget for the GBD is $1.11 million in the first year, with the vast majority paid out of homeowners’ taxes. Responding to why San Francisco Public Works is pushing for GBDs in certain areas, spokeswoman Rachel Gordon said that GBDs pay for services above and beyond what the city provides. McHugh argued that, for an unsolicited study, the 12.6 percent response rate was high and indicated that it was at least worth taking a vote on the GBD. He noted that satisfaction levels of the 36 percent that support the GBD are similar to the 46 percent that wanted more information. “Like any major policy issue, there’s going to be a wide variety of opinions,” he said. NextSnap: How long will this last? If the GBD does not make the neighborhood a homeless exclusion zone, there’s really no point. 90% of the problems are caused by the homeless and meth-heads – emptying the contents of trash bins onto the ground, pooping, camping, breaking into cars, screaming and accosting people. The city currently spends a quarter of a BILLION dollars on homeless issues and there is already plenty of “outreach.” The issues in SF… most visible in the microcosm of the Mission, have nothing to do with money, and everything to do with a “progressive” ideal that excuses and condones bad behavior in the name of social justice, plain and simple. We do not need to be throwing more taxpayer money into a system that is not willing to enforce the existing rules, and continue to overlook the root cause of what makes the mission such a mess. If this were just about cleaning up leftover beer bottles in the park, simply mobilize the volunteer army. But to confront the homeless mess, this will not work. San Francisco property owners pay enough taxes as is. Unfortunately , none of SF’s elected officials have any significant private sector management experience. There is enough money. We need experienced managers. Property Owners do not all pay “enough taxes as is.” Thanks to Prop 13, those who bought their homes long ago, for much less than the current assessed value, get a huge break on their property taxes every year. The article refers to the electorate as homeowners. While 77% of this GBD’s assessments are on residential property, all properties are eligible to vote. In the recent SoMa West CBD election, City properties comprised almost 5% of the electorate. Voting turnout of just over 50% meant that over 9% of the vote came from City properties. It was enough to swing that election. The largest opposition vote in the West SoMa CBD came from CalTrans. For the Mission Dolores GBD, City properties comprise over 5% of the weighted vote, led by the park and Mission High School. An interesting question is who will cast the City’s ballots? Will SFUSD cast its $20,000 vote? Will DPW vote on their behalf? I’m not happy with the idea of giving funds budgeted for education to a private corporation. This GBD has a commercial district – primarily along Valencia – that assesses properties at double the rate of the remainder of the district. These properties will no doubt receive super-enhanced services. However, fully 11% ($117,000) of the GBD’s assessments will come from residential properties within the commercial zone. Tough luck when properties around the corner are assessed at half of your rate. Commercial tenants with “Net” leases can have the assessments passed through to them. So we have the lovely situation of merchants ineligible to vote required to pay the assessment. Democracy in action! On the other hand, tenants in rent controlled properties cannot have the assessment added to their rent. Landlords of these properties will be forced to swallow the assessment. The Prop. 13 cap on annual property tax increases does not apply to benefit districts. The Mission Dolores GBD’s cap on increases is 3% per year. The City describes its police and fire departments as Safety Services. Since the GBD won’t be putting out fires, it’s fair to describe their Safety Services as a private police force. Never mind that they will be called ambassadors and likely be outfitted in marching band uniforms. Call it what it is. Will they receive law enforcement or social services training? Who has liability if one of these employees oversteps legal boundaries? To me the concept looks like an ACLU lawsuit waiting to happen. 11 billion for a 7×7 sq. mile town of approx. 850,000. The forecast is for an ever increasing budget by leaps and bounds with revenue pouring in. Ranked with Detroit, Cleveland, and Washington DC as among the worst run cities in the country. Explain and solve this dichotomy first. The criteria for getting the proposal to a vote and the criteria for getting the district passed by the property owners seems to be a topic that few can get straight. Even this article got it wrong. Procedures are in the SF Business and Tax code Chapter 15A and the CA Government Code §53753. To get the proposal to the Board of Supervisors to approve going back to the property owners for a vote, the organizers need to get property owners responsible for 30% of the proposed total $1,062,250 first year assessments to sign petitions. Only then can the Supes allow an election where property owners essentially get one vote for every dollar of their first year assessment. Then of the votes cast, if 50% of the votes regardless of how many cast are protest votes, the plan dies. The ballots sent to the property owners will have the total assessments due in 20 installments for the next ten years, so most will likely see the number as scary compared to any special services they will see over the next ten years. I’ve heard some fear that there is potential for corruption. Not the case. All the names and parcels of the property owners who submit petitions and who vote in the election are public information after the votes are tallied. Somehow, my comment above hasn’t got the vote right. In the balloting, votes are WEIGHTED proportional to the size of the property owners assessment. San Francisco government entities control as many votes as 395 average residential property owners. The business properties will have as much weigh as 636 average residential properties. Look around you, there aren’t many of those low tax basis people left. All the old timers are dead and the kiddies took the cash and ran (probably to never talk to each other again.) The Bronx may have its tales but Frisco has its ironies. Pick your own block and do a little research on when the addresses last turned over. I’ll grant you property has increased in value way beyond the CPI but remember what happened last time we had a serious downturn? This city has a twelve BILLION dollar budget–and downtown still cries poor. On a per capita basis I’ll bet money that’s the highest in the world. That’s nothing less than a travesty. One of these days the public will figure it out. I take that back–the public will never figure it out. But for now we get the wool pulled over our eyes with schemes such as greenbelt districts, or whatever they’re called. For what this city spent redoing Dolores Park and greening Guerrero I’ll again bet that ninety percent of the rest of the country could rebuild every school in their county. Otherwise, just ANOTHER bureaucracy filled with people that think they’re way more important than they truly are. And that’s how this city rolls. I guess my dog will appreciate a few more sidewalk gardens. Thanks, but no thanks. And thank god for prop 13. It’s only a matter of time before those in City Hall start prancing around in togas with laurels around their head. any reporting from the meeting this week?